During the past year I started working on my “bucket list” a little more aggressively than in the past, for a variety of reasons I won’t go into here. As a basketball fan, one of those bucket list items is to see the most heated, energetic rivalry in college basketball, which is UNC (University of North Carolina) vs Duke University. Rather than make this a very long blog post, I’ll point out the Wikipedia page that’s specific to the rivalry, above and beyond the Wikipedia pages for the schools themselves. Informed fans would tell you there’s a big difference between the two team stadiums, one (UNC’s) being much newer, bigger, more modern, and the other (Duke’s, called Cameron Indoor Stadium) being older, more traditional, and much smaller. As you might expect, given the same level of energy, it feels much louder and more exciting in the small stadium. And I don’t actually think that “given” or predicate is true. 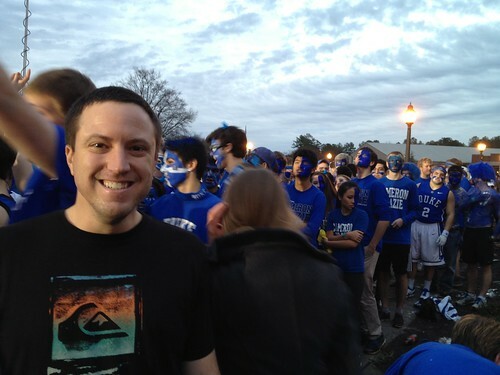 People who’ve gone to the game in both arenas say the raw level of energy of the fans is higher at Duke anyways. Because the stadium is small and the game famous, it’s challenging to get tickets. It was actually harder (and more costly) to get these tickets than any other game I’ve been to, including Final Fours, NBA Finals, Superbowls, and more. Students camp out for days, if not weeks, outside the stadium, to get a place in the line that eventually populates the student section of the arena. They stay in unheated tents in the winter, forming a little tent town known as Krzyzysheki-ville (K-Ville) for short, after the coach’s last name, which we walked through and explored. 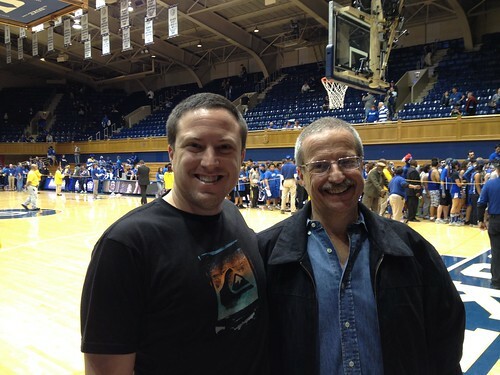 People, such as my dad, fly from all over the world to see the game. He came to the US literally for about 36 hours (excluding flight time) to hang out with me and watch the game. The game and atmosphere did not disappoint. It exceeded my very high expectations. I’ve never been to a more energetic, high-intensity stadium. The entire crowd was standing pretty much the whole time, with people jumping up and down. I took a few videos and still photos, but I don’t think they do it justice. Here’s one of many YouTube videos (by DukeBluePlanet, not me) showing the Cameron Crazies (the aforementioned student section) in action a couple of years ago. UNC won, going away, in an impressive display of confidence and skill. But even so, the crowd kept supporting Duke, chanting, jumping up and down, and generally out-doing every other crowd I’ve seen. The Duke campus is beautiful as well. We walked around it a whole bunch before and after the game. The Chapel and Botanical Gardens stood out.